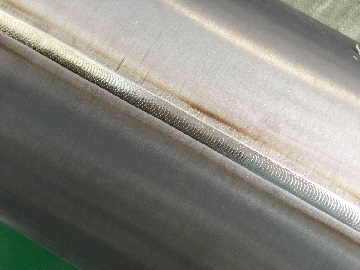 The welding surface of a titanium Gr.2 welded pipe. Recently, we just supplied 12 pieces of grade 2 titanium welded pipes to a Danish client. Pipe specification: 12″ STD, length = 3 meters. The welded pipes are manufactured in accordance with ASME SB-862 by TIG automatic welding. The welding surface exhibits silver metal luster with two shallow straw bands along the edge of HAZ.